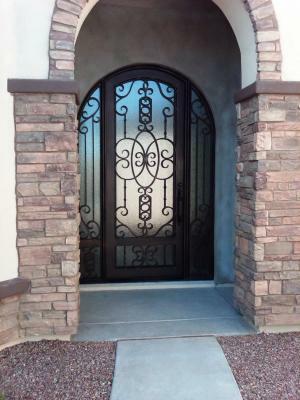 All across the Phoenix valley, customers turn to Signature Iron Doors for their decorative iron needs. Homeowners and contractors everywhere continue to find pleasure with the quality of Signature Iron Doors. 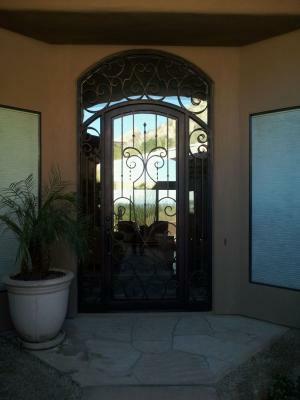 A couple months ago, a few families in Glendale Arizona sought online to find a renowned iron door manufacturer near them and on first search located Signature Iron Doors. After a careful review, they gave us a call and came in to meet with our sales team and view our shown room. We looked over their plans and showed them a few of the doors we had in stock. One family fell in love with this Cortina style door and since we keep a full inventory of our popular designs, we were able to install one for them to fit their new home within days. The other family liked a few of our designs, so to best match their needs; our artisans provided a custom drawing for them. Within a few months, our welders and technicians had their door built and installed.